Origin: Artist's studio. 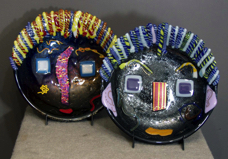 These bowls are a series of individual pieces of hand formed glass melted together to create the appearance of a face. The hair is achieved by laying hand formed glass twists along the hairline and melting them into the surface. These bowls are made with a black irridized face and various accent colors. The bowls pictured are only examples. I create these with black faces with usually blue, red, yellow or multi latticino accents for the hair.. Specify your accent color choice. We will try to accommodate your request, although we may have to create one, which will take 3 weeks to ship. We have stands for these at $2.00 additional charge.